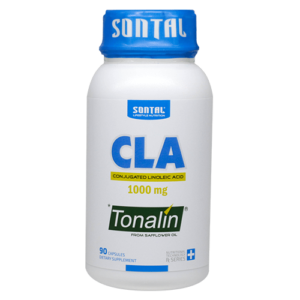 SONTAL Tonalin® CLA is a speciality product, which has been clinically proven to reduce body fat, while maintaining lean body mass and preventing fat regain. • Unless you follow a strict diet and exercise program you struggle to maintain your ideal weight. • Stop the yo-yo effect. Take control your weight by using SONTAL Tonalin® CLA. • You can reach your ideal weight without over-complicating your diet and workout regimen. • Decrease the amount of fat your body stores. • Maintain lean muscle mass by burning calories more efficiently. • Prevent fat cells from refilling, so you remain toned and lean. Sourced from natural safflower oil, Tonalin® CLA (conjugated linoleic acid) is natural and environmentally sustainable. Our proprietary manufacturing process produces the highest quality CLA available. For safe, effective results, be sure to ask for Tonalin® by name. When you consume fat that your body does not need to use for energy, it is absorbed by fat cells with the help of an enzyme called lipoprotein lipase. CLA blocks this enzyme and diverts unused fat to your muscle cells. The CLA then activates another enzyme which helps your muscle to burn this fat, especially during exercise. That’s why, when used in balance with a healthy diet and regular exercise program, Tonalin® CLA is so effective in helping you lose body fat, and keep it off. Because it is so effective, Tonalin® CLA can also help eliminate the unhealthy “yo-yoing” pattern of losing and gaining weight. Clinical studies have proven that Tonalin® can prevent fat regain. Tonalin® is the world’s most carefully researched CLA, with currently 18 major studies proving its safety and effectiveness. The U.S. Food & Drug Administration has recognized Tonalin® as FDA GRAS, which means it has passed their highest safety standards for a food ingredient. That’s why Tonalin® CLA is the brand that’s trusted by healthcare professionals. Clinically tested Tonalin® CLA is the highest quality way to supply the CLA that your body is missing, and a healthy way to help achieve your fitness goals. Directions for use: As a dietary supplement adults should take 1 (one) soft-gels 3 (three) times daily before meals, or as directed by a healthcare practitioner.